February marks the beginning of spring in our garden. The winter is certainly not behind us, and we’ll be glad to have more rainy days, but the garden is awakening and the blossoms are stunning. 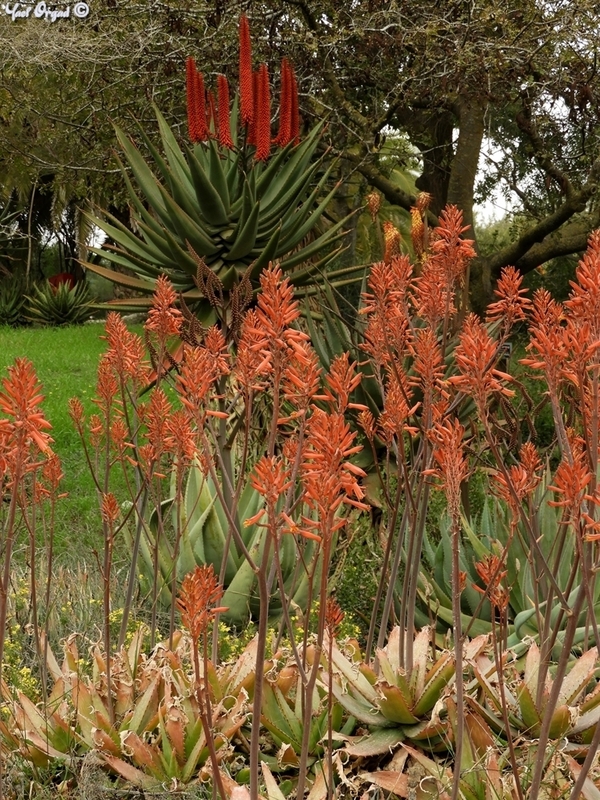 The recommended section is the South-Africa section, where the Aloe species give a breathtaking display. There’s lots to see – let’s get started! As promised, we’re starting with the South-Africa section. The Genus Aloe has over 500 different species of succulent plants with lovely flowers, most of them originate in Africa and nearby islands, but some grow in the Arabian Peninsula. In our garden there are about 40 species, and in this season most of them are blooming. 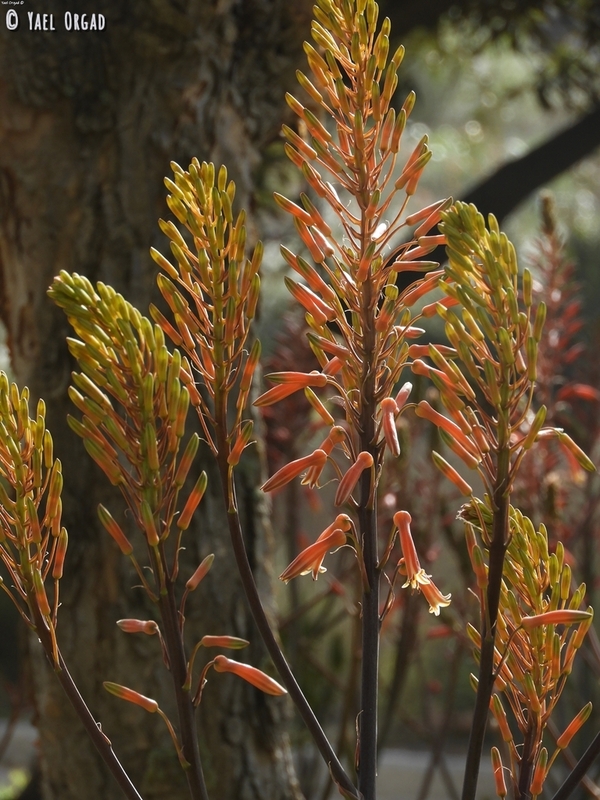 The rocky terrain around the ancient burial caves in the South Africa section are covered with wonderful shades of orange and red – this is the Aloe aff. 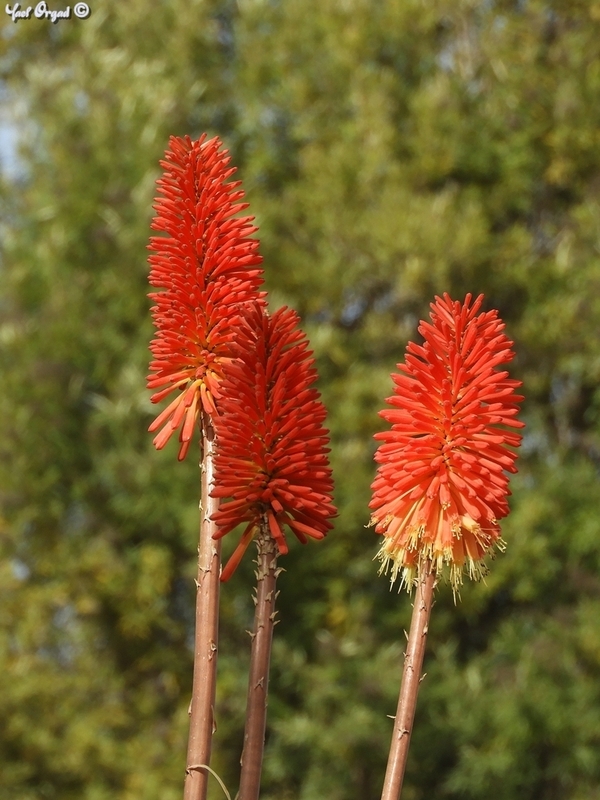 maculata – a hybrid aloe. 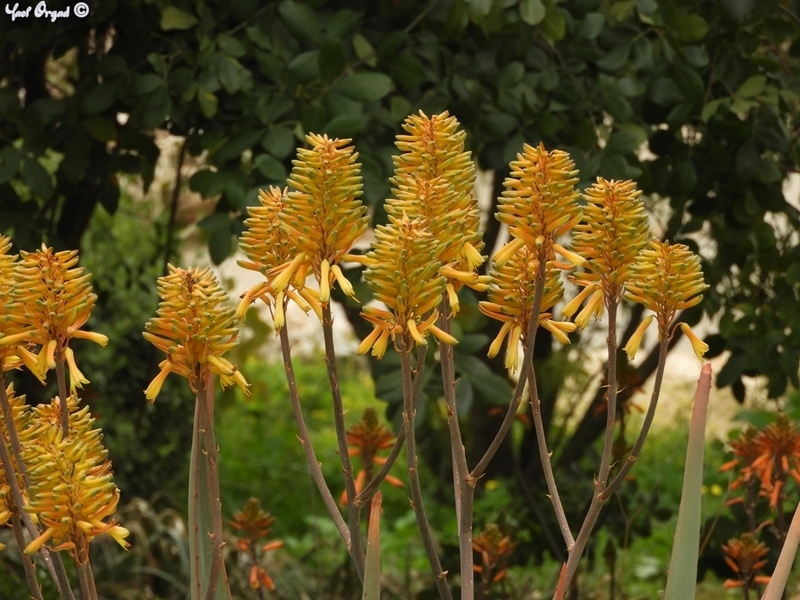 The Aloe flowers have elongated red-orange and sometimes yellow flowers. These flowers are full of nectar, and they attract many birds that enjoy the nectar and pollinate the flowers. 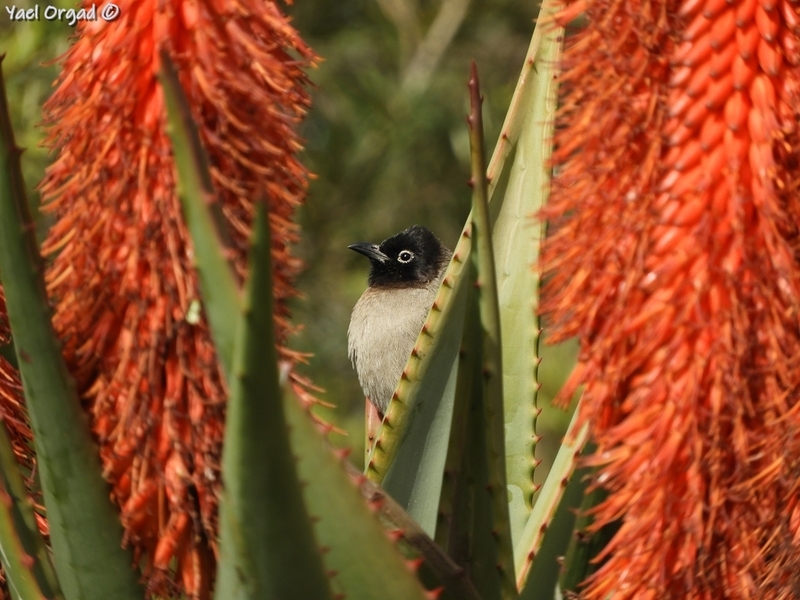 In the pictures you can see the White-spectacled bulbul and the Common chiffchaff enjoy the flowers of Aloe ferox, which is the most imoressive Aloe in the garden; and the male Palestine sunbird enjoying a hybrid Aloe. 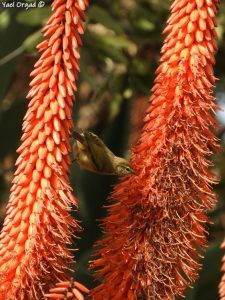 Many Aloe species bloom in wintertime. 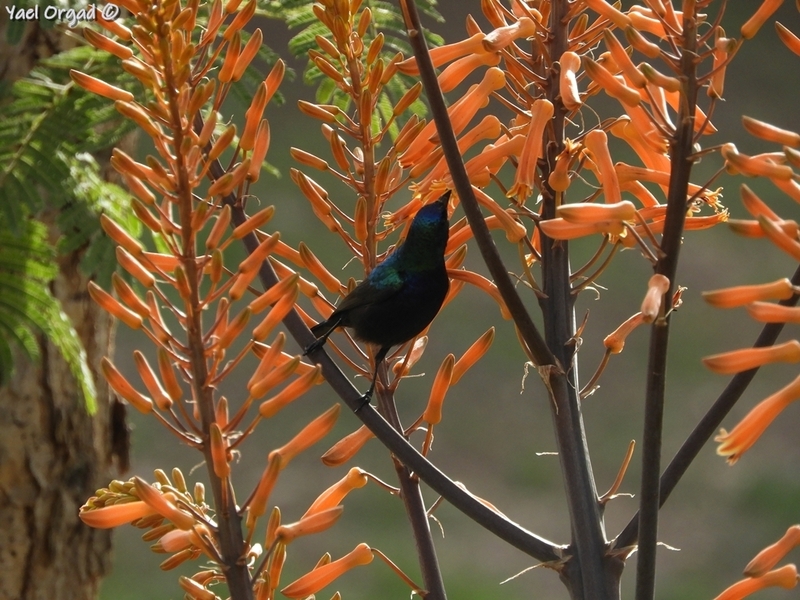 In South Africa they bloom in July-August, Winter of the Southern Hemisphere. In our garden they adjusted to the local seasons, and they bloom in January-February. Aloe parvibracteata or Short-Bract Aloe is named for its short bracts, compared to other Aloe species. This is one of the smaller Aloe species in the garden. 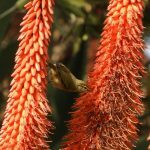 Aloe cryptopoda is named the Hidden Aloe because of the flower stalks that are hidden between bracts. It was used to produce cloth-dye. Many Aloe species are used in traditional medicine. The best known one is the Aloe vera, but additional species were used as well – externally for skin discomforts, and juice prepared and used internally for digestive discomfort. Some of the species are used for flavor extract and drinks. 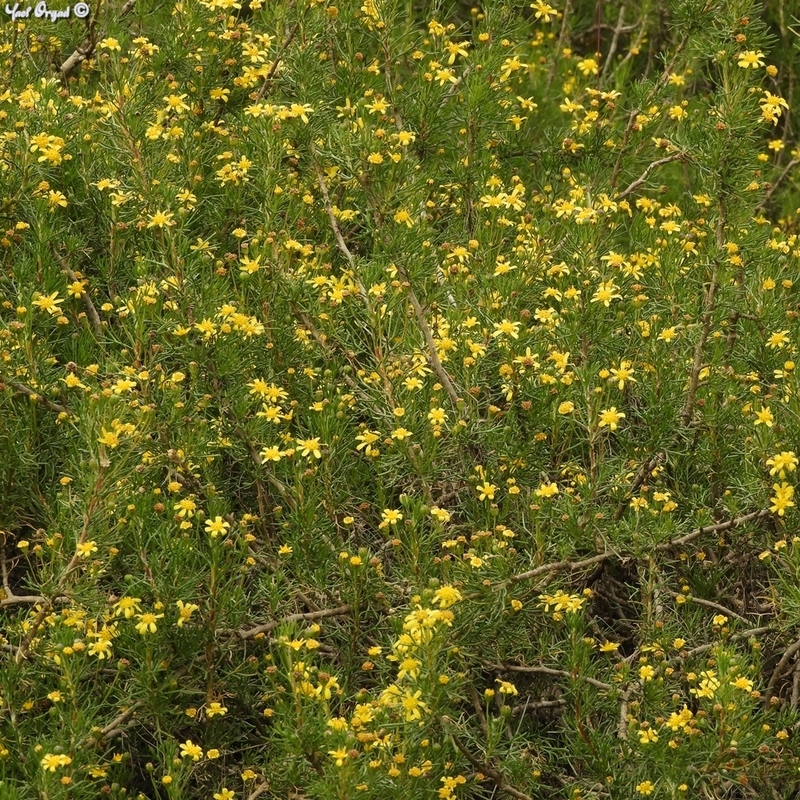 Euryops multifidus – an expanding shrub with relatively small flowers, sun-loving and water-saving, it appears in the invasive species list in the state of Arizona in the US but does not show invasiveness in Israel. Euryops lateriflorus – an evergreen, sun-loving, water-saving shrub with lovely foliage. Euryops pectinatus – with big inflorescences, water saving, frost resistant and easy to grow – features that makes it a good ornamental plant, liked by many gardeners around the world. 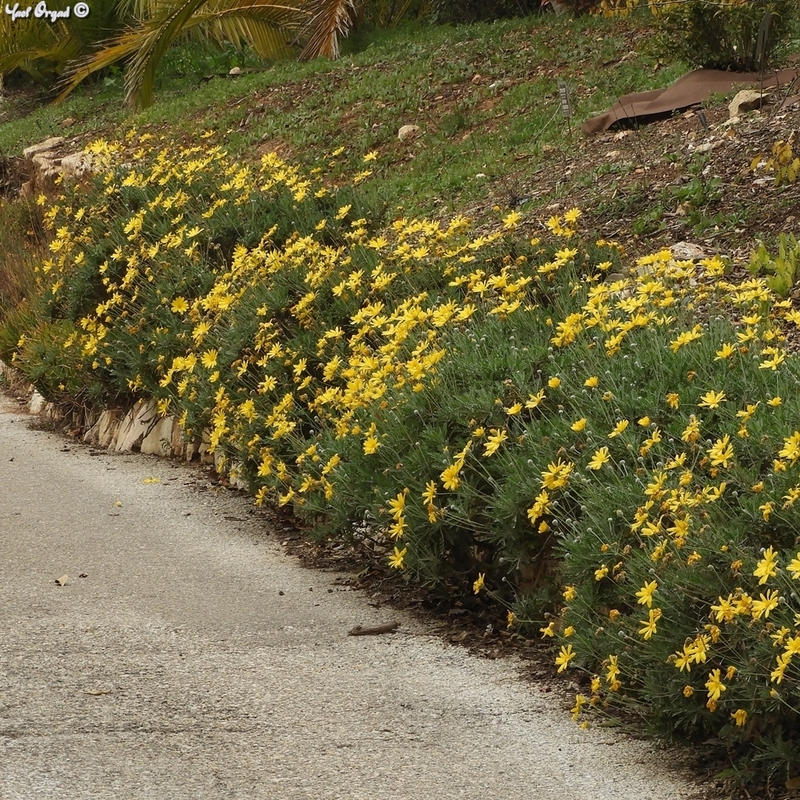 Near the burial cave you can see tall flowering racemes with an attractive red-yellow inflorescence. This is Kniphofia ‘Winter Cheer’ – a garden variety of the Kniphofia uvaria, a perennial sun-loving herbaceous flower, which is drought-resistant, frost-resistant and wind-resistant. 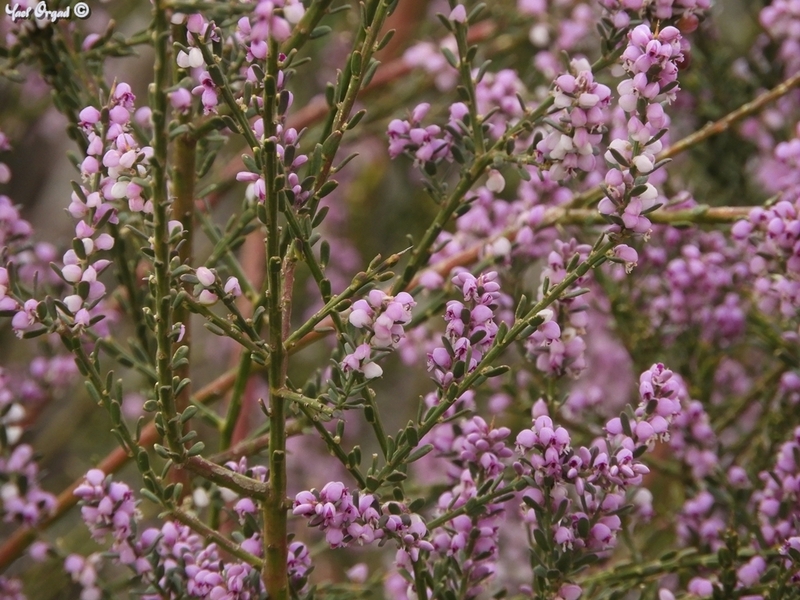 Another pink-flowered shrub is attracting the eyes with its dense small flowers and the slender yet spiny foliage. This is Muraltia spinose. The Muraltia is called “Tortoise berry” because its fruits, that are edible and sweet, are eaten by tortoises and birds, and they disperse the seeds. At the side of the trails in the South Africa section Felicia amelloides is smiling at us. 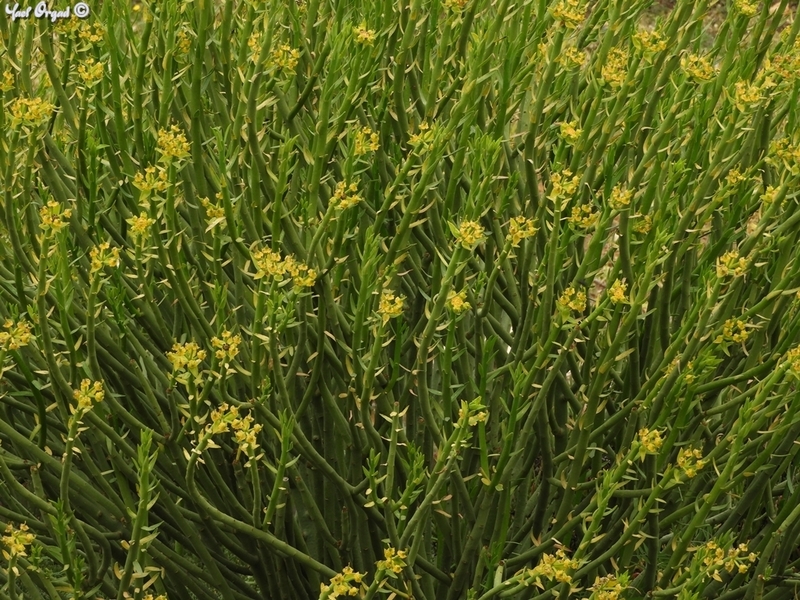 This is an evergreen shrublet that grows along the southern coast of South Africa, mainly in sandy planes and stabilized dunes. It was brought to Europe in the 18th century, and became a favorite of gardeners. Continuing our hike in the South Africa section, we’ll turn our attention to a shrub with succulent pencil-like stems and little greenish-yellow flowers: this is Euphorbia mauritanica. This Euphorbia grows in well-drained soil, in full sun to partial-shade, and it is highly resistant to drought, diseases and pests. Its white milky sap is poisonous and may cause irritation when you touch it. 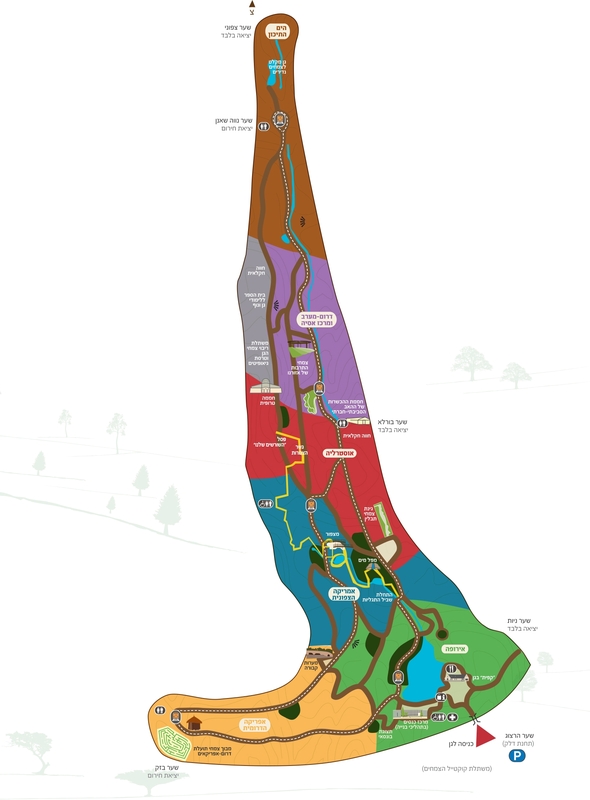 There is so much more to see in the South-Africa section, but the rest of the garden has lots to see as well! If you’re not too tired, let’s continue our hike! All over the garden you can see the Cyclamen persicum waking up. 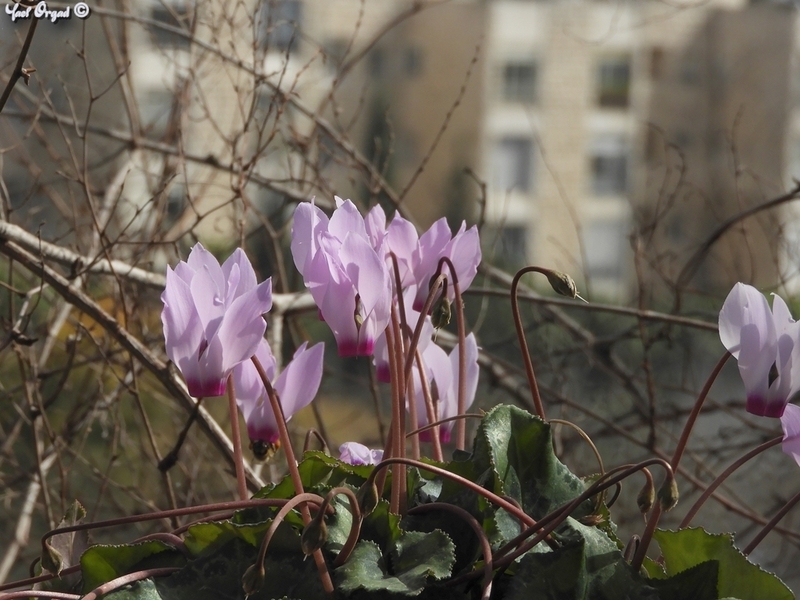 Cyclamen persicum, Israel’s national flower and our plant of the month, blooms during winter and early spring. In order to cope with the weather, it flower bends downwards and raises the petals backwards – thus protecting the stamens and pistil. Look for the Cyclamen in the garden’s rockeries, in the walls and next to the trails. Most of our cyclamens are local, they were in the area before the botanical gardens were established, others were rescued form building sites. The seasonal local wildflowers are awakening all over the garden: Anemone coronaria, Asphodelus ramosus and Silene aegyptiaca grow all over the garden, mostly at the edges of garden beds. 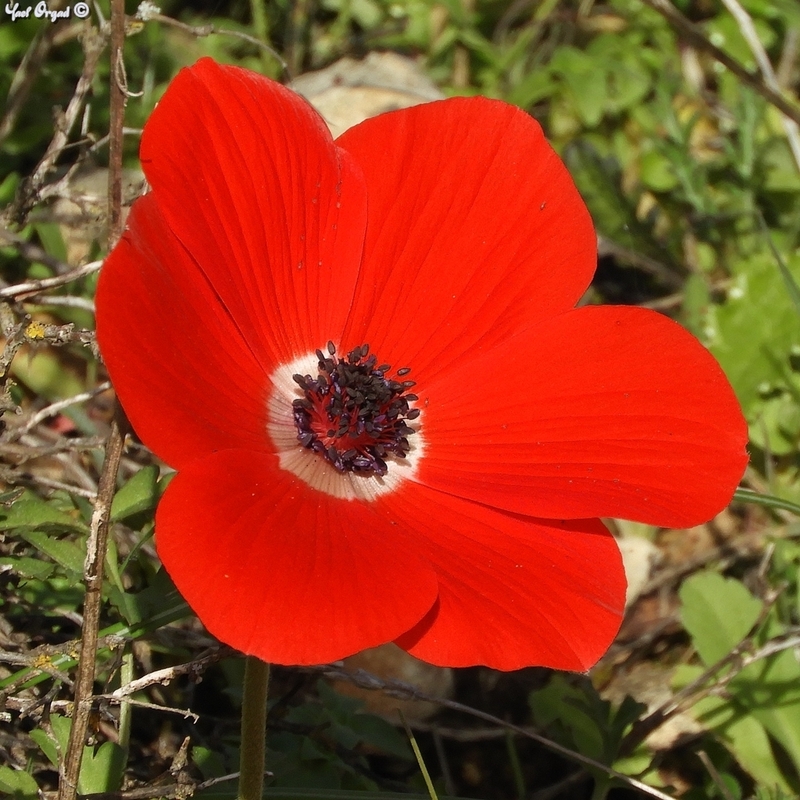 All three are common species in Israel, mainly in the Mediterranean region, but also in North-facing (less arid) slopes. Anemone coronaria attracts the eye with its lovely colors. In the garden we planted all the different color variants, but only the red colored Anemones are native wildflowers here. 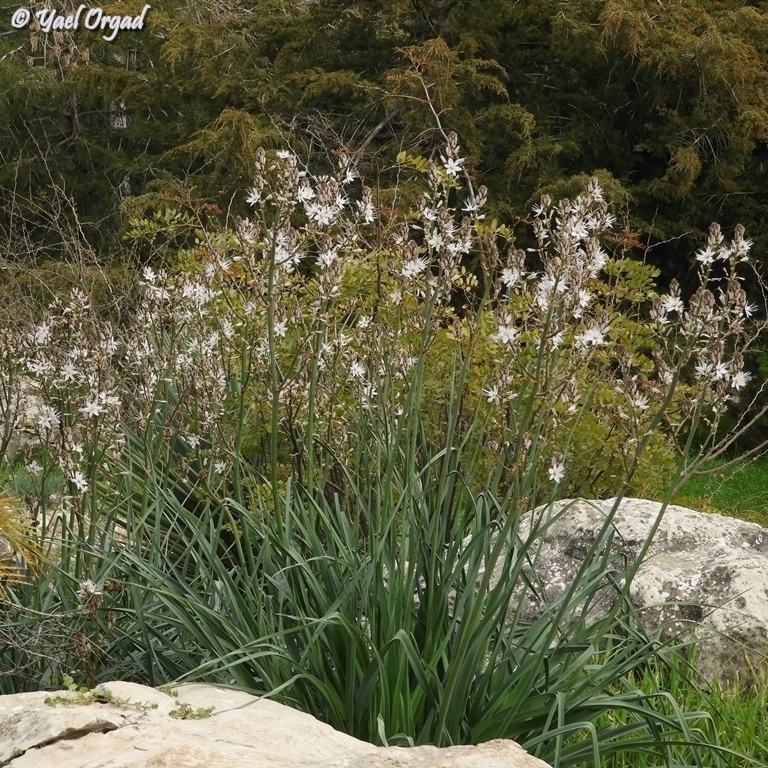 Asphodelus ramosus has impressive flowering white clusters. Its Latin name comes from ancient Greek – Asphodel meadows where the place where all ordinary souls where sent to live after death. The Asphodelus was commonly planted in ancient cemeteries. 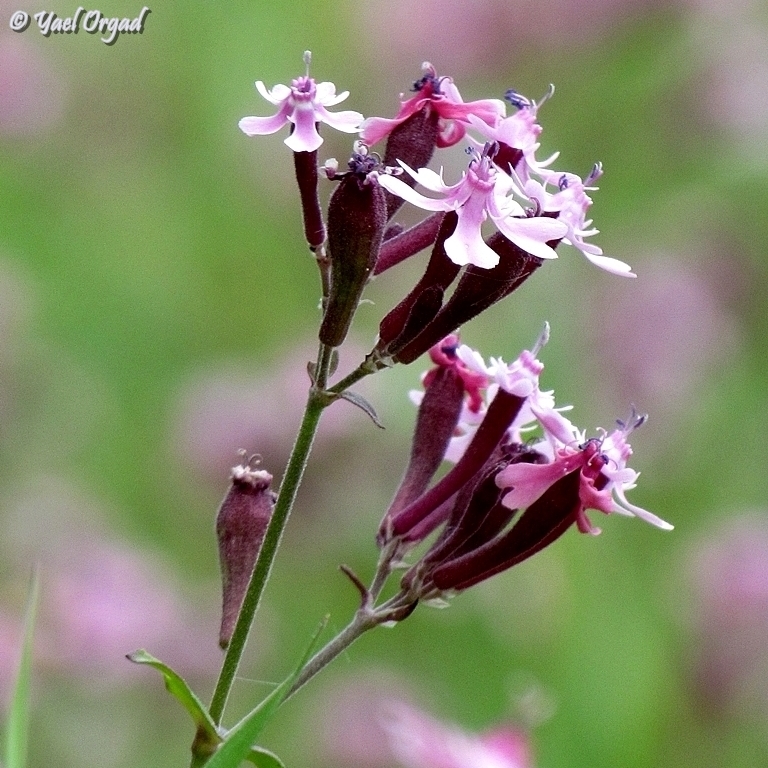 The Silene aegyptiaca is a small annual flower that has adjusted to growing in plantations and in this season you can see pink Silene carpets in the Olive groves around the county. 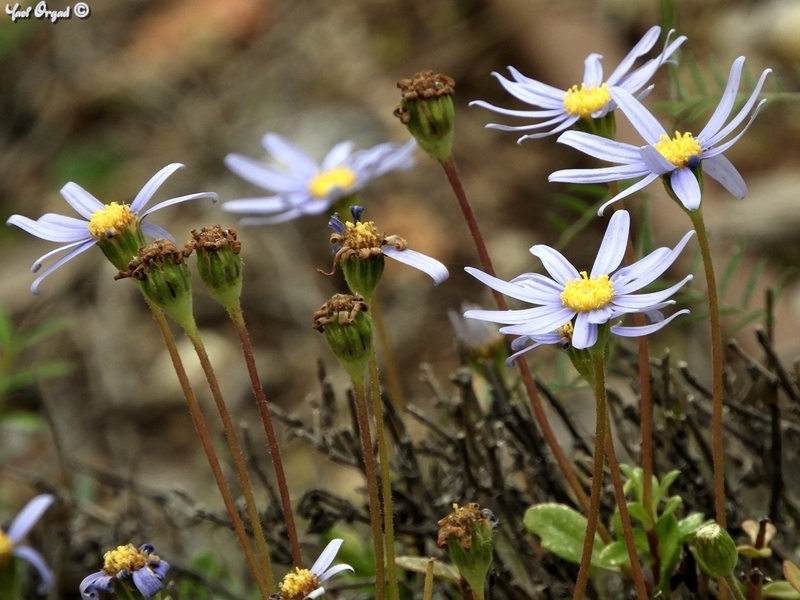 It is also a beloved garden flower, that blooms earlier than other wild flowers. 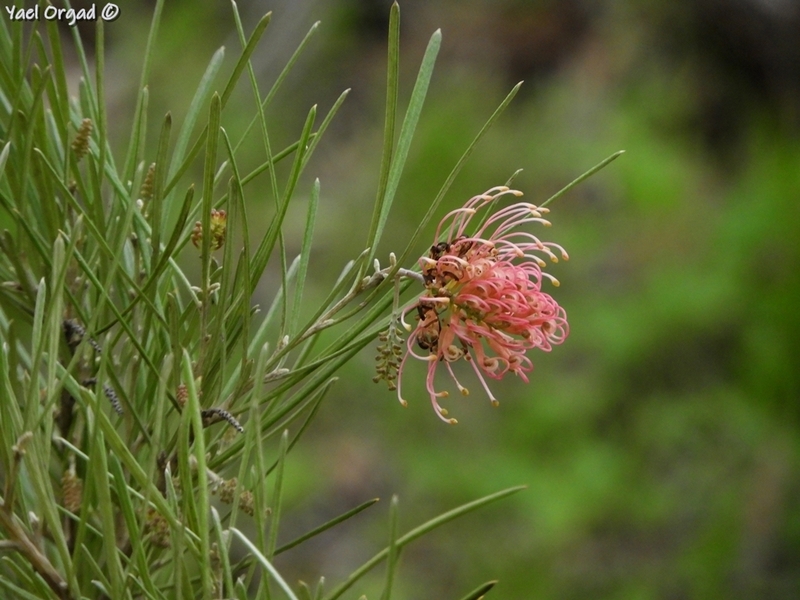 In the Australia Section we can see awakening Grevillea species. The Grevillea, also known as “the Spider-flower” is a genus with about 360 species, most of them from Australia to Indonesia area. In the garden there are several Grevillea species. 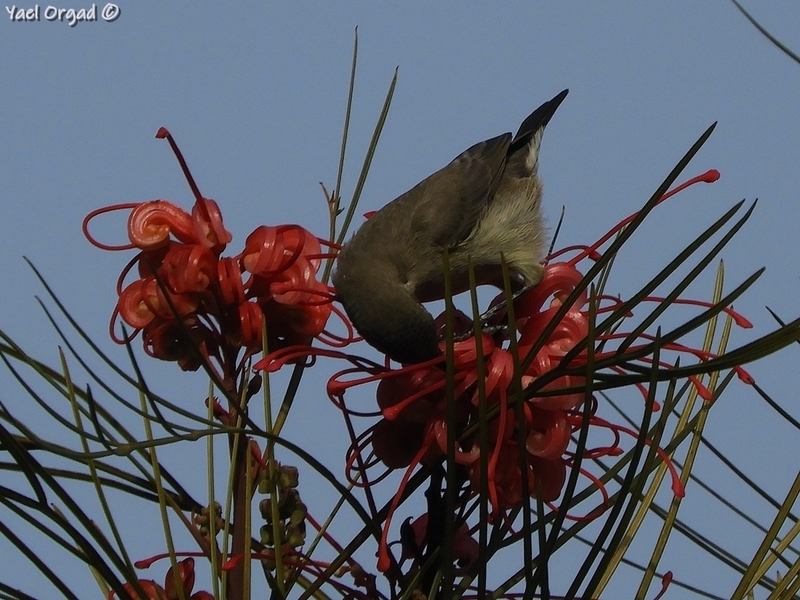 In the picture you can see the female Palestine sunbird enjoying the nectar of Grevillea johnsonii, a big shrub, up to 4.5 m tall, endemic to South-East Australia and Grevillea brachystachya, a short shrub, about 1 m tall, endemic to western Australia. In the medicinal-spice section as well as in several locations in the Mediterranean section you can see a lovely shrub blooming in violet-blue. This is the Rosmarinus officinalis or Rosemary. Smell the leaves – their fragrance is very pleasant. This shrub attracts bees that enjoy its nectar. 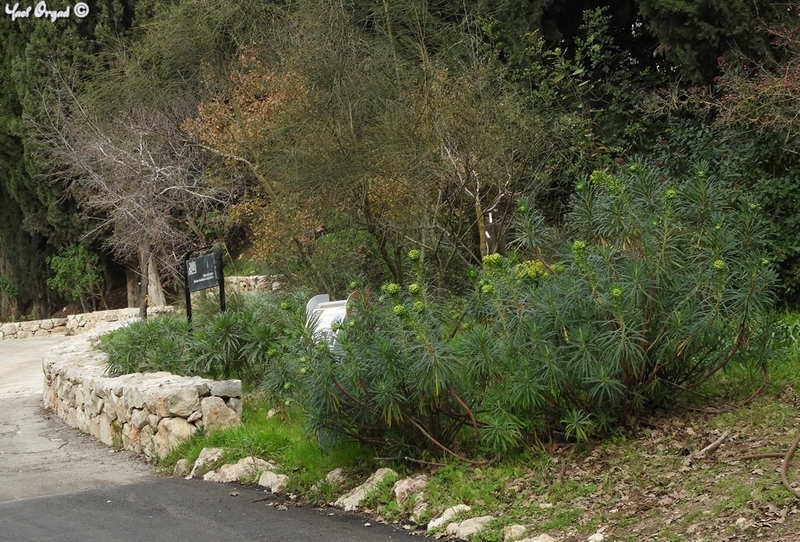 Rosmarinus officinalis is one of the more common gardening plants in Israel and worldwide, mainly because it is draught resistant and air-pollution resistant. 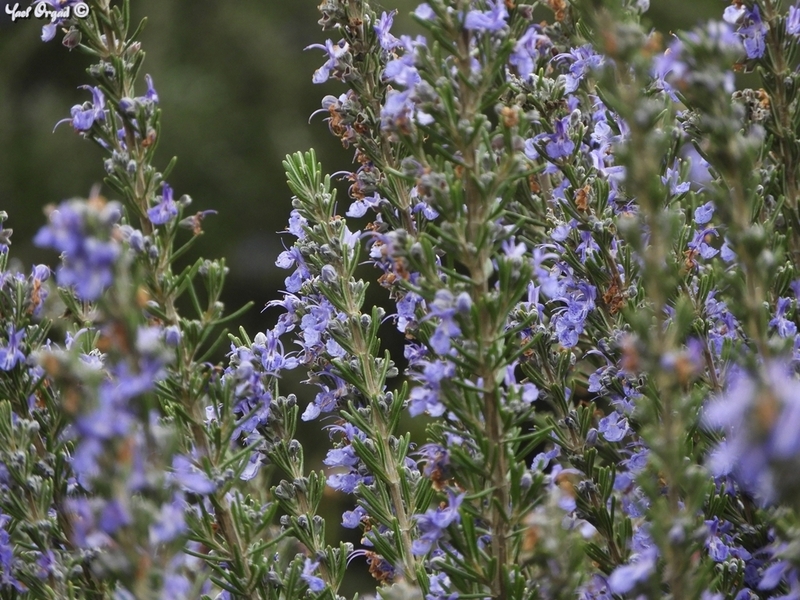 Rosemary is used for spicing food and wine. In the past, its antibacterial traits were used to preserve meat. In the middle ages, people believed the Rosemary has the strength to drive away demons, so Rosemary branches were hung at home and placed in the bed. The smell repels insect pests, so it was used in libraries and wardrobes. Having arrived to the Mediterranean section, near the main road of the garden another Euphorbia is blooming: this is the Euphorbia characias or Mediterranean spurge. 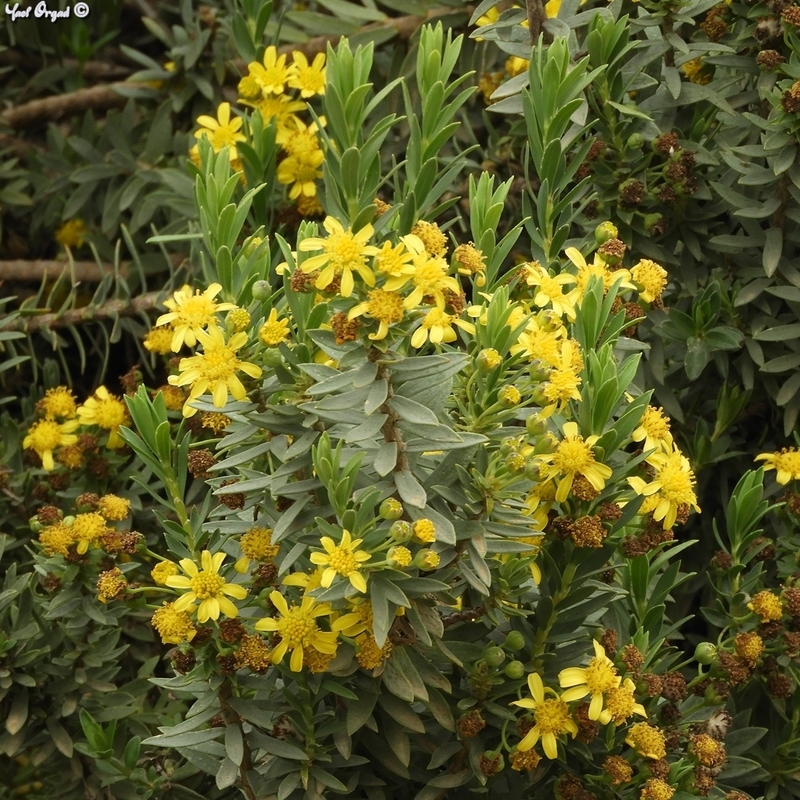 It grows mostly in the northern side of the Mediterranean basin, but can be found in Libya and Morocco as well. This is a big and impressive plant with inflorescences that look from a distance as small greenish heads – and up close as a raceme of delicate bells. This is also a recommended water saving gardening plant. Spring is almost upon us, and the garden is full of life! You are welcome to come and visit the garden, enjoy the beautiful luscious bloom!